From English trifle to... brussells sprouts? Not as far-fetched as you think. After all, being pregnant means you crave all kinds of weird things but most of all, it's important to eat a healthy diet and wide variety of things. So lately, my sweet man has been looking up healthy recipes and stepping up his weeknight cooking and I couldn't be happier. If it were up to me some nights, I'd eat pickles and ice cream and throw in some popcorn for good measure. Not my usual fare, I know, but like I said, your relationship with food takes on a whole new meaning when you've got a bun in the oven. So, here are three really good dishes we tried recently, one of which is an old standby of mine, and two were newly found recipes. The first one comes from one of our favorite cookbooks: The Silver Spoon, Italy's version of the Joy of Cooking. It's 1200-page tome that will make your head spin but it's also organized extremely well by ingredient and color coded with each recipe only a few lines long. Very simple and very user-friendly (read: perfect for baby daddys-in-training). It was easy, very healthy and very tasty. Bring the stock to boil in a pan. Heat oil in another pan, add the onion, carrot and celery and cook over low heat, stirring occasionally, for 5 minutes until softened. Add the spinach, season with salt and cook for a few minutes more. Add the garbanzo beans and stock and simmer for 20-30 min. Add the pasta and cook until al dente. Season with pepper, drizzle with olive oil and serve. (Also great sprinkled with fresh grated parmigiano before serving). The second recipe is my version of Italian style brussells sprouts. The only thing that makes them Italian is the parmesan cheese, which could be left out if you prefer. I love brussells sprouts and they happen to have protein, folic acid, lots of Vitamin D and A and are just plain good for you. So we cooked them up to go along with the garbanzo bean and spinach soup and they were a deliciously crunchy side dish alongside the steamy soup. Prepare a pound of brussells sprouts by washing and cutting them in half lengthwise. Then heat the butter and olive oil in a large skillet. (you could make these healthier by omitting the butter, but the butter really is what makes them so delicious). Place the b.s. cut side down in the hot butter-oil mixture, turn up the heat and let them get nice and brown, for about 5-7 min. When they are brown on one side, add a splash of water to the pan just to steam them through, put the lid on the pan and cook gently until tender, but not soft, when pierced with a fork. Sprinkle with salt and pepper and freshly grated parmigiano and serve them while piping hot. The final healthy dish we loved was from Martha Rose Shulman's "Recipes for Health" series in the New York Times. My midwife said I should be getting more protein since I don't eat a lot of meat. So we looked for protein-rich foods and found this recipe in the Fitness and Nutrition section of the Times (a great resource for simple, healthy recipes). This is definitely a dish we'll return to and it could be modified in lots of ways. The recipe says to serve with grains or noodles and we chose red quinoa for it's protein-richness and nutty taste. But the next day I ate some leftovers served over soba noodles and it was equally tasty. A bright and colorful dish that packs a lot of nutrients and tastes great. What more could you need? The recipe? Here it is. I've always wanted to make one. It's a dessert that appeals to both my fondness for culturally specific foods, and my love of all things creamy. Desserts that combine fruit, cake, custard and whipped cream cannot be anything but delicious, now can they? I started ogling big glass trifle bowls a couple of years ago, wondering if I should splurge for the perfect one at Williams-Sonoma not too long ago. But then I decided it was foolish to buy a bowl that really only served one purpose. 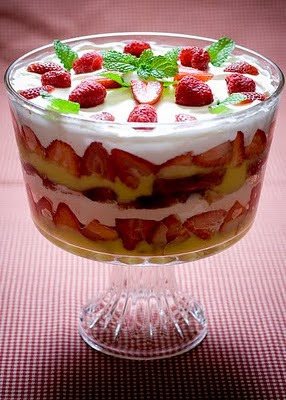 A proper trifle bowl apparently has straight sides instead of round and has a platform base, the better to see the beautiful layers in this rich dessert. I wanted to make one for a dinner party so I did what I usually do when I need something but don't want to spend lots of money: I headed to my local thrift store. Lo and behold, there was a perfect big glass bowl for only $3.99. I would finally get to make my English trifle! Besides doing it ahead of time so it has time to chill overnight, it's pretty easy to make. There are millions of trifle recipes out there but I found one for cherry trifle in Nigella Lawson's How to be a Domestic Goddess. I love her easy-going, laid back approach to things. She recommends using any kind of bowl large enough to hold it, and either store-bought ladyfingers or "any stale cake lying around." I happened to have a 6-in round almond cake in the freezer that was left from the wedding cake testing. Perfect. I bought some mixed berry jam and some strawberries and already had the morello cherries in the fridge. All I need to make were the custard and the whipped cream topping. Make the brandy-vanilla infusion by bring 4 T brandy to a boil with split vanilla bean, then boil for 2 min until thickened. Remove from heat and set aside. Slice the pound cake and make jam sandwiches with the cherry jam, and layer the bottom of a large wide trifle bowl. Pour over the vanilla brandy so that the cake soaks it up, and then top with the drained cherries (and strawberries). Cover with cling wrap and leave to macerate while you make the custard. In a saucepan warm the milk and cream. Whisk the egg yolks and sugar in a large bowl. Pour the warm milk and cream into the bowl whisking it into the yolks and sugar mixture, and pour the custard back into the saucepan. Cook over a medium heat until the custard thickens, stirring all the time. Make sure it doesn't boil, as it will split and curdle. Keep a sink full of cold water so that if you get scared you can plunge the bottom of the custard pan into the cold water and whisk like mad, which will avert possible crisis. Once it is ready, pour into a bowl to cool and cover the top of the custard with cling wrap to prevent a skin from forming. When the custard is cold, pour and spread it over the fruit and cake layer in the trifle bowl, and leave in the refrigerator to set, covered in cling wrap overnight, or for at least 12 hours. When you are ready to decorate, softly whip the cream for the topping and spread it gently over the layer of custard. Then toast almonds for a few minutes and make syrup by heating and stirring the cherry jam, lemon juice and water over medium heat until thickened. Let cool slightly. Drizzle cherry syrup over whipped cream and sprinkle with toasted almonds. Serves about 10 people, or makes lots of leftovers! Bring to the table in a flourish of oohs and ahhs and dig in. People will definitely have seconds of this delicious dessert. Cheers!